Did you know Calabria, one of the poorest of Italy’s 20 regions, is actually the source of 25% of the country’s olive oil? And that in the 2009 Guida ai Migliori Oli del Mondo di Qualità Accertata (Guide to the Best Olive Oils in the World, Quality Assured), among the top six, three were Italian–and *two* of those were Calabrian? Yes, down here in the toe of the boot, we have some excellent olive oil or olio d’oliva — that glorious provider of monounsaturated fats, which can naturally lower your cholesterol and risk of heart disease. FYI, extra-virgin quality aka EVOO is the healthiest as it is the least processed, keeping intact all those fabulous antioxidants that also keep your heart healthy. Now you probably don’t think of Calabria as a main source of olive oil because producers here are often families with small groves who get their olives pressed at local mills; they use the oil for themselves and their families, give some away, sell some locally, and then perhaps sell the rest to wholesalers who take our dense, robust Calabrian olive oil and mix it with that of other regions and smack a label on it as being from *that* region–probably famous for its, ahem, olive oil. I’m not naming names, but rest assured that even some the largest olive oil companies engage in this practice–and nobody’s complaining. Hey, everyone has access to great olive oil, gets paid, and us here in Calabria? We still have some of the best olive oil in the country right in our backyards, only we get it fresh from the press. Win, win, win, right Joe of Italyville? Well, for those of you who aren’t lucky enough to have neighbors who gift you their Calabrian olive oil, how would you like to get some of the good stuff straight from the source delivered right to your door? Especially for you foodies out there, I highly suggest trying out true Calabrian olive oil at least once in your life (trust me, you’ll want more). Not only is it great for preserving fish, eggplant, mushrooms, and any number of vegetables, it’s the absolute best for preserving our beloved peperoncino. Use this year’s oil fresh on salads and last year’s oil for frying, and you’ll soon find out why, if given the choice, most Calabrians avoid the stores and go straight to the presses for their olive oil. If you like what you see at the Cossari website, be sure to contact Vincenzo, who speaks perfect English, at vcossari(at)hotmail(dot)it or through the contact form on the site, and let him know I sent you. And soon you, too, can be enjoying this wonderful sapore di Calabria in the comfort of your own home. P.S. 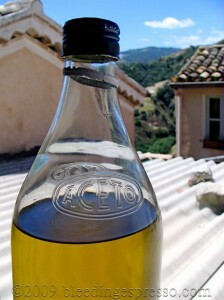 Yes, the first photo shows olive oil in a vinegar bottle (aceto means vinegar in Italian for those who don’t know). This is because we often receive olive oil in large five liter bidoni so we transfer it to smaller, emptied out bottles for ease of pouring. Reduce, reuse, recycle baby! What’s your favorite way to enjoy olive oil? Frying seafood in it, especially flounder. Good oil on fresh bread with a pinch of sea salt. I could subsist on that alone and die a happy man. .-= Paul Anater´s last blog ..This ‘n that ‘n bric ‘n brac ‘n things =-. My favorite way to enjoy olive oil is by making aglio/olio with spaghettini, red pepper flakes and parsley!!!!!!!!!!!!!!!!! I made some just yesterday. If I say spoonful by spoonful would that be too much? Okay, fine. I like to make yummy homemade bread and dip it into the olive oil. Sometimes we add herbs. And a really good way is to mix olive oil and goat’s cheese for a spread. Delicious! .-= Kalee´s last blog ..50 Things I Unabashedly Love =-. Oh I miss the fresh pressed oils…. on bread (how I miss rosette too! ), on pasta, on anything and drizzled over everything….sigh. But now you have so much…snow. Ahem. Well I’ll have your share of olive oil, OK? .-= anna l’americana´s last blog ..Cupid’s Arrow…. =-. Would they ship to the US? And what is the conversion price in US dollars? I would love to try this! .-= Lori´s last blog ..I’m super cool (and pretty sweet) =-. We make our own oil so I use it for everything (even some cakes!) but right now I enjoy it most of all in insalata di pomodoro, which I think may just be the perfect summertime food. I’m with you on that summer salad, KC. *So* good! I cook with olive oil almost everyday. This sound fantastic and I need to check out his website. I saw an olive oil/lemon cake recipe once. I want to try it. .-= nyc/caribbean ragazza´s last blog ..Just What Rome Needs… =-. Dear Michelle, I totally agree with you! Even coming from Puglia (another big producer of extra virgin olive oil) I must admit Calabria makes fantastic extra virgin olive oil! i am an extra virgin olive oil taster and every time i get to taste the one from Calabria….I recognize the distinctive flavors right away. I love extra virgin olive oil with warm bread (ideally cooked in stone oven and made of durum wheat). Mmmm drizzled on warm bread…I may have to have some right now (I was lucky to get a warm loaf from the store a few minutes ago! .-= stile mediterraneo´s last blog ..Frisella dry bread from Puglia! =-. i love olive oil in all of my food, but especially simplest with tomato, basil and mozzarella! I like to mix it with vinegar and use it as a dip for my French bread…mmmm….yummy! Sometimes I add some garlic to it as well. We used to have a bidoni of 20 litres full of olive oil from Calabria in our cantina, basement. And one evening I somehow must have unluckily touched the valve – and slowly, overnight, some 15 litres of wonderful green thick olive oil leaked into the basement… what a mess ! and what a pitty !!! But we always buy olive oil while in Calabria and ship it back home. So do all friends and family. Have to check where we buy from. Will check the website you mentioned. Thanks for sharing! 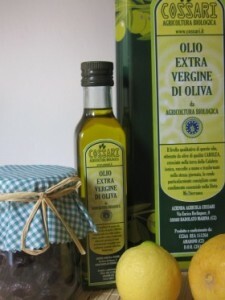 Thanks for sharing your olive oil experiences in Calabria Suzie…so sad about the spillage though! .-= Suzie´s last blog ..cancelli di ferro battuto =-. We have 10 olive trees here in amantea, we managed 546 kilos with our first collection last year, we manage to press just over 50 litres ( we got more but we chose to pay for their services with Oil rather than cash), pressin your own olives is great, a weekend of work and a good little earner if you choose to sell your oil.. as for me and my family, we kept most of it :)..
you got it right Michelle! “l’oro di Calabria” as my aunt often says and it’s simply wonderful. I always bring 2 luggage to Calabria. One is empty on the way there:) Hope you’re enjoying the summer. Summer is flying by as always Joe…where does this time escape to anyway?! .-= joe@italyville´s last blog ..Italian Tunes =-.